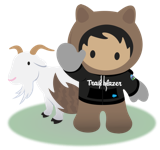 Mike is the Senior Director of Admin Evangelism at Salesforce, Mike is the founder of the Salesforce Admins podcast which is a great resource Salesforce Admins and Developers to learn about new Salesforce features and best practices. Mike is a Certified Salesforce.com Admin, Adv. Admin, and Sales Cloud Consultant who is responsible for helping passionate customers realize the benefits of the Salesforce Platform.####His education includes the following degrees; Marketing/ Public Relations, and a BA in Communication Studies from the University of Iowa. Mike Gerholdt hasn't posted any ideas yet.